Hi guys! 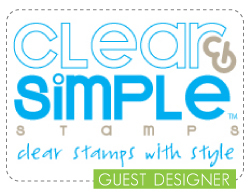 Welcome to Clear & Simple Stamps Party Blog Hop day! Now this is my first Party Blog Hop, so be gentle:) The gals in the CSS DT are expert party planners (Elena, I'm pointing at you! ), and I'm just trying to keep up! Now when it comes to party hosting, I've thrown a TON of kids parties over the years. Birthday parties, team parties, laser tag parties, swimming parties, and even a reptile show party! When I started to work on my projects for this week's blog hop, I wanted to try something a bit more grown up. An anniversary cocktail party fit the bill. I'm still infatuated with gold, so I went with a gold and black color theme. Working my way backwards (lol! 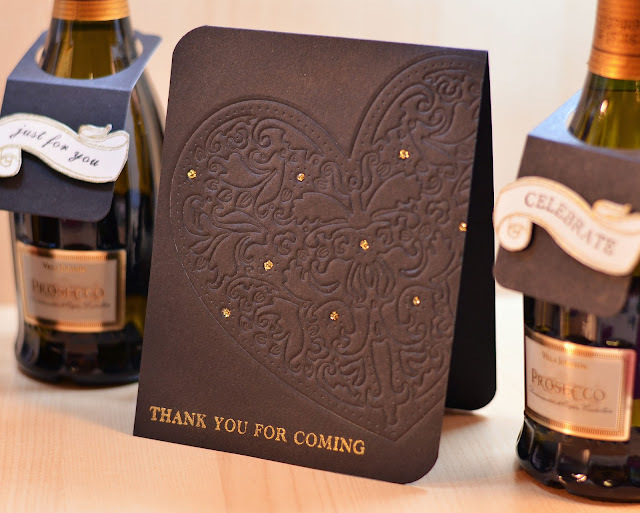 ), I created a thank you card using the heart doily die to deboss a pattern on deep black card stock. This die is perfect for debossing! I offset the large heart design and added a little bit of glittery detail with dots of Stickles within the pattern of the doily. Simple and classic. Now I can say I survived my first Party Blog Hop! Thanks so much for visiting today! I'll be back later this month with some more CSS goodies:) Definitely go check out the CSS Design Team for some amazing party ideas! Fabulous projects, JJ! I love them all! Everything is so elegant and lovely. I need to hire you if I am hosting a special adult party. Beautiful project. The debossing on the card looks SO elegant. This is so gorgeous!!! WOW! The heart embossed like that is so chic! It almost looks good enough to eat. STUNNING! You really achieved an adult party look, very elegant. Could easily be for a wedding or engagement? Love it! Ack, I am so IN LOVE with that debossed heart!!! Really makes you want to touch it! And how perfect for thank you notes where you're probably going to be creating several of them. Super-cute and creative wine tags. 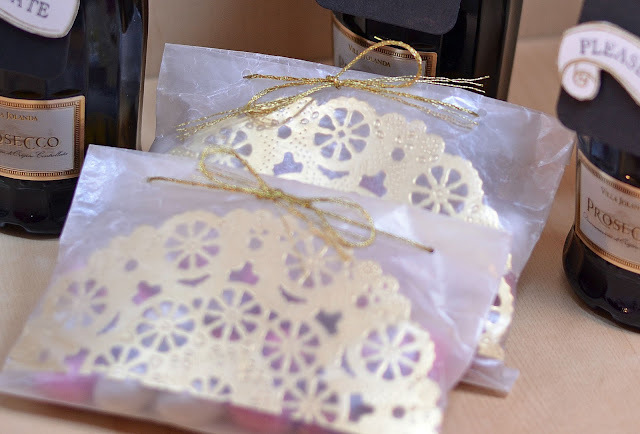 And the glassine bags with the gold doilies are perfectly grown-up for this party. great set. really love the dry embossed card and gold glitter on it. What a pretty ensemble!! Love the doily inside the bag. This set is so beautiful! I love all the gold, and the embossed heart on the card is amazing! Beautiful projects, JJ! I'm in love with that debossed heart! This is gorgeous! Love the rich color scheme with the little touches of gold and the debossed heart image, too. 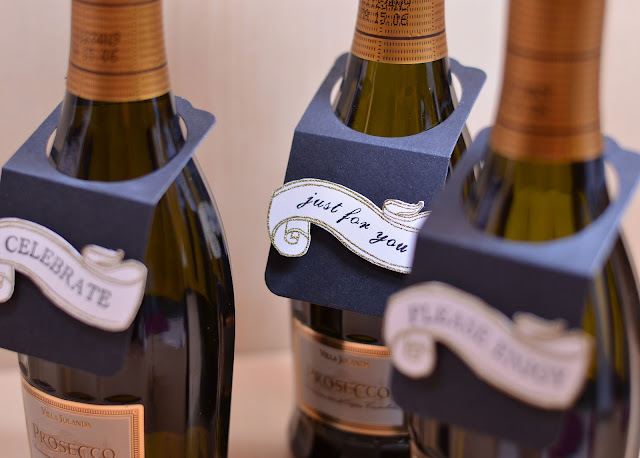 Oh now this is so elegant - a grown up party - everything is fit for a wedding JJ - love the rich gold, dry embossing, and classic elegant color scheme. You made it so fun too with the goodie bags and mini bottles!